The life cycle of the forest was always present in Carr's perception and in her work, from young trees to old-growth-forest giants to those returning to the earth as stumps and logs. Images of roots often occurred in Carr's paintings, whether in the form of driftwood thrown up on the beach or in the large exposed root systems we see in Forest Interior. These are the result of mature trees having been pushed over by a powerful wind, pulling up the woven mat of their root systems as they have fallen. Once they had generated life, "strong roots hidden in the silent, live ground," as Carr wrote in her journal Hundreds and Thousands as she reflected on forest growth bursting from the earth. Now, upended, they will provide living spaces for insects and other life, eventually decaying into the humus on the forest floor. Forest Interior is densely packed with vegetative life. Young trees in the foreground stand in a row before a thick stump, above which tower two twisted and powerful root systems, while between them, undergrowth ripples through a narrow channel like green water. A screen of trees forms the backdrop, with a central glow of light filtering through it, creating a transcendent atmosphere. Carr was conscious of creating a unity of movement in works such as this to reflect the great throb of life energy she saw running through everything - rising from the forest floor and running through the trees with a rhythmic roll and a buzzing electricity. Carr's medium in this extraordinary painting is that of oil on paper. This medium, which she used extensively in the 1930s, allowed her great freedom to innovate. This use of oil paint, thinned with turpentine and sometimes gasoline, allowed Carr to retain the richness of oil, but it had a fluidity like that of watercolour. It also facilitated her use of sweeping brush-strokes that embodied the energy she was perceiving in the landscape. 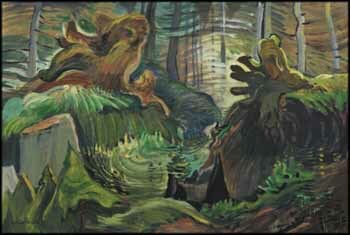 Its effects could range from light washes, such as those she used in her seashore paintings, to the denser pigmentation seen here in Forest Interior, which glows with rich greens and deep, warm earth tones. In her journal Carr reflected on her own artistic "roots," writing, "So, artist, you too from the deeps of your soul, down among dark and silence, let your roots creep forth, gaining strength. Drive them in deep, take firm hold of the beloved Earth Mother...Draw deeply from the good nourishment of the earth but rise into the glory of the light and air and sunshine." Forest Interior immerses the viewer in the renewing aliveness of the woods and allows us to see it on a deeper level. Having seen Carr's work even briefly, our perception of West Coast forests is richer. For those who have spent time with her work, it is hard to imagine being in the forest and not seeing an overlay of her powerful vision of it, and feeling our own roots in nature.